First off, I want to thank the publisher and Lawrence for an ARC of Grey Sister in exchange for an honest review. This is no way influences my review or the tears I shed during my time in Nona’s world. It isn’t often that you come across a sequel that is better than the original. The 2nd book in a series typically lags, or is just filler for the action-packed finale; maybe it just doesn’t live up the promise set in Book 1 or the hype/expectation overshadows reality. Well, let’s just say Lawrence doesn’t disappoint at all with Grey Sister. In fact, I believe he is still continuing to fine tune his writing to the point where he may get better with each and every release. This should make for a very fine future in the world of fantasy. Taking place approximately two (2) years after the events of Red Sister, one of my Top 20 Reads of 2017 (just outside my Top 5), we find ourselves back in the Convent of Sweet Mercy. To say not much has changed is a fabrication. Our characters are older, have experienced traumatic events typically reserved for older generations, and are now moving further along in their training which will become more grueling as the ice reaches ever closer. As Nona is set to prepare for her trial, one that will define the order she is to join, an Inquisition arrives on Sweet Mercy’s doorstep. Sisters will be questioned, blood will be spilled, and demons will rise to the surface. Nona must make a decision as to which order she will join and, in turn, determine what path she will take. I don’t enjoy going into too much detail with reviews because the whole basis of a review is to tell you WHY I believe it should be your next read, or at least one of your next few. Lawrence has a way of weaving different elements into a story and intertwining them so perfectly that you find yourself immersed in his writing. From character development to world-building, Grey Sister has it all. The magic system employed has all types of layers we once thought peeled back in Red Sister, but are more fully revealed this go-round. We understand more about the power of the great shiphearts, though to wield one can cause great corruption and contamination, and we plunge into the thread-weaving abilities of some sisters which I thought was definite highlight in the story. Nona was our major focal point in Red Sister, and while she is still our main POV in Grey Sister, we are given a few more sets of eyes with which to see the world from. Abbess Glass feels like Olenna Tyrell from Game of Thrones, what with her stern wisdom and ultimate badassery in Season 7. Then you have Sister Kettle, sweet at heart but deadly with a knife. Though all three (3) characters take different paths to the culmination of Grey Sister, each POV is necessary to the overall storyline in ways unimaginable. Grey Sister is emotionally fraught and dramatically intense, and is worth every second stuck in its world. 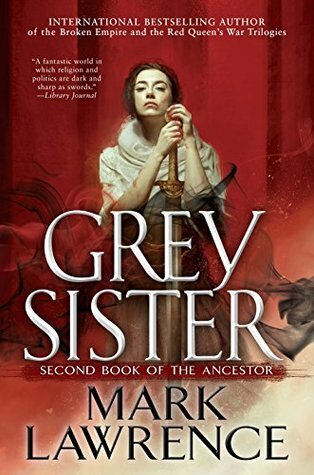 If you want me to tell you the absolute truth, you should read Grey Sister because Mark Lawrence is a genius, one of the best readers today, and top 5 in my all-time list. The prose alone is the reason I read every book he writes, but his characters continue to hold special places in my heart. Although it is not necessary to read ‘Red Sister’ in order to enjoy ‘Grey Sister’, thanks to the author being kind enough to write some catch-up notes, I do implore you to read it. If you are like me, you’ll fall in love with Nona and want to spend as much time with her as possible. Glad to hear you enjoyed it! I know… that ending had me choking back the tears!